Vietnam is a shopping paradise. The streets of its main cities like Hanoi, the capital, are full of markets where you can find authentic bargains: clothing, footwear, accessories and a wide range of handicrafts. It is important to keep in mind that the cheapest items are those that are manufactured in the country, so everything imported will have a similar price to the U.K. For example, it is not worth buying electronics or mobile phones since they are not cheaper than in any European countries. All cities have shopping centres, although most of them are focused on tourists. The Vietnamese usually buy their wares in the markets, where they must go to different stalls to pick up all the items they need. 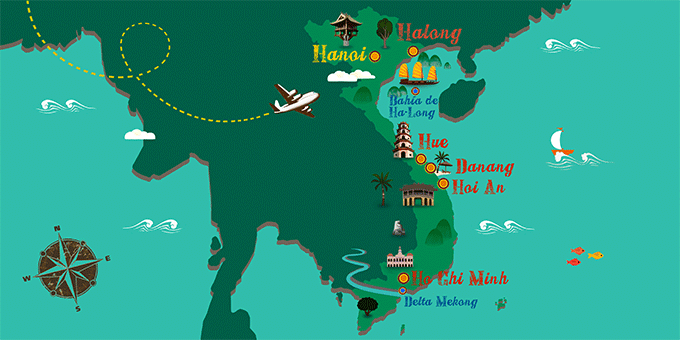 The best places to go shopping are Hanoi, where you will find the old market; Ho Chi Minh City, where the Ben Thanh Market, An Dong and the modern Windsor Plaza shopping center are located; Or Hoi An, where you can find custom-made clothing. All the comments below belong to people who have travelled to Vietnam with Exoticca in the past 18 months. Our tour of Vietnam taught us lots about the country and gave us valuable insight into the culture. “The hotels were all excellent and the guides very knowledgeable, helpful and efficient. In fact our group mentioned that we wanted to go to the new Golden Bridge while in Central Vietnam and this was promptly arranged as an extra excursion for those that wished to go.